The latest edition of This Issue features artist Russell Wray from Hancock, Maine. Russell was twice arrested at Bath Iron Works during the most recent ‘christenings’ of destroyers at the shipyard. Russell leads an organization called COAST (Citizens Opposing Active Sonar Threats) and was largely motivated to do civil disobedience at BIW due to Navy sonar’s impact on sea life – particularly whales and dolphins. 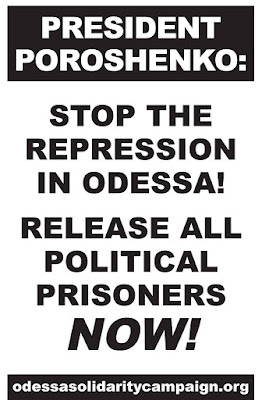 Oppose Fascism & Political Repression in Odessa, Ukraine! Three years ago, the U.S. government supported a violent right-wing coup in Ukraine carried out with the use of neo-Nazi paramilitary organizations. The pro-coup campaign was known as “Maidan,” for the city square in the capital city of Kiev where the anti-government assaults were carried out. Less than three months later, on May 2, 2014, at least 46 mostly young people known as “Anti-Maidan” were murdered when a massive, fascist-led mob set fire to the House of Trade Unions in the Black Sea city of Odessa. This Tuesday, May 2, 2017, Odessans will mark the third anniversary of this massacre by gathering at the site of the murders. They will lay flowers, sing songs, remember their dead and again raise their demand for an international investigation into the murders - a demand that has been continually blocked by the Ukrainian government. And once again the fascist organizations are threatening to attack their memorial. “On the eve of the third anniversary of the events of May 2, 2014, the situation in Odessa is getting worse every day,” writes a supporter of the Council of Mothers of May 2, which represents the relatives of those who died at the House of Trade Unions. “And while previously these threats were raised mainly by professional organizers, this year floods of lies are being produced by representatives of official state institutions: Odessa prosecutors, officials of the Ministry of Internal Affairs, representatives of the military department. They are all warning about preparations for allegedly armed provocations on May 2 in Odessa. These threats of violence follow the arrests by federal police of several anti-fascist Odessans now falsely charged with serious crimes. Ominous reports are surfacing about plans to arrest more relatives and supporters and “extract confessions” of plans to commit violent acts against the government. To support the courageous people of Odessa, the Odessa Solidarity Campaign called for an International Day of Solidarity with the People of Odessa, which took place on April 10, the 73rd anniversary of the day Odessa was liberated from years of fascist occupation. 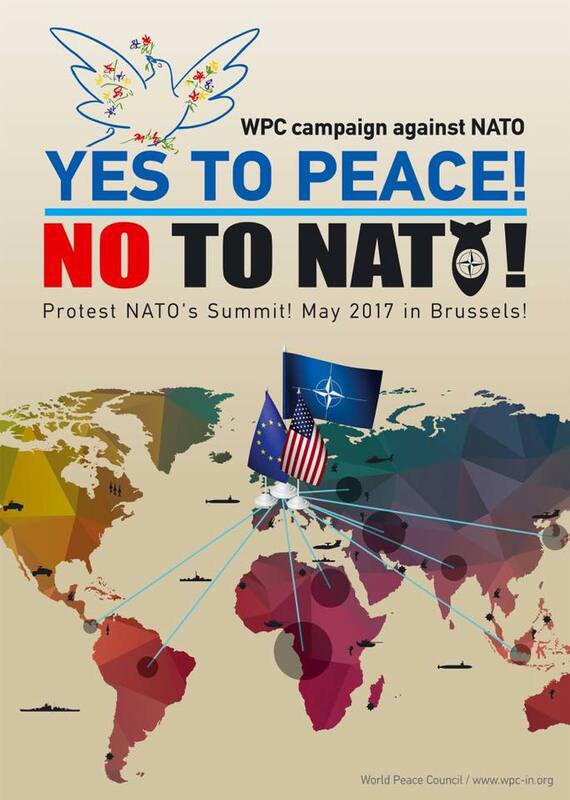 Actions took place in 20 cities in 13 countries across Europe and North America. That solidarity must now continue. Since the massacre of 2014, the continuing demand of Odessans for an international investigation has been a serious problem for the Ukrainian government. If the voices of these brave people are allowed to be silenced, Ukraine will have taken another huge step toward becoming a repressive police state in collusion with murderous fascist groups. Free all political prisoners in Ukraine! President Obama and King Salman Arabia stand at attention during the U.S. national anthem as the First Lady stands in the background with other officials on Jan. 27, 2015, at the start of Obama’s State Visit to Saudi Arabia. 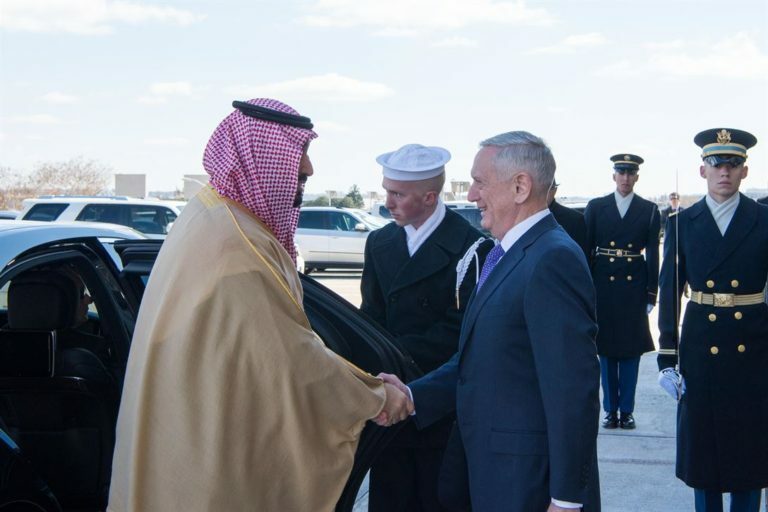 Defense Secretary Jim Mattis welcomes Saudi Deputy Crown Prince and Defense Minister Mohammed bin Salman to the Pentagon, March 16, 2017. ~ Dennis J Bernstein is a host of “Flashpoints” on the Pacifica radio network and the author of Special Ed: Voices from a Hidden Classroom. You can access the audio archives at www.flashpoints.net. Video from Seongju, South Korea showing US Army trucks driving through the protesting villagers (with 8,000 South Korean police deployed to keep the streets open) delivering the radars and interceptors for the THAAD 'missile defense' system to the new base. Especially watch the last bit of the video so you can get a glimpse of the suffering the US is causing with this deployment. It happened like a sneak attack in the dead of night. All set procedures were utterly disregarded. With US Forces Korea and the Ministry of National Defense proceeding on Apr. 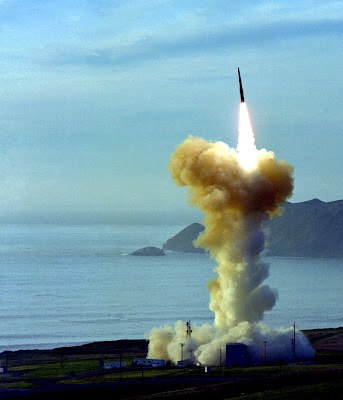 26 with the deployment of a Terminal High Altitude Area Defense (THAAD) missile defense system, the question for many now is just who made the decision and when. Whoever it was - and whatever their intentions - is likely to face accusations of interfering in the May 9 presidential election, where the THAAD issue was certain to be a key point of contention. It's clear that this deployment was timed to be done before the coming May 9 elections as it now appears that a progressive candidate is leading in the polls. 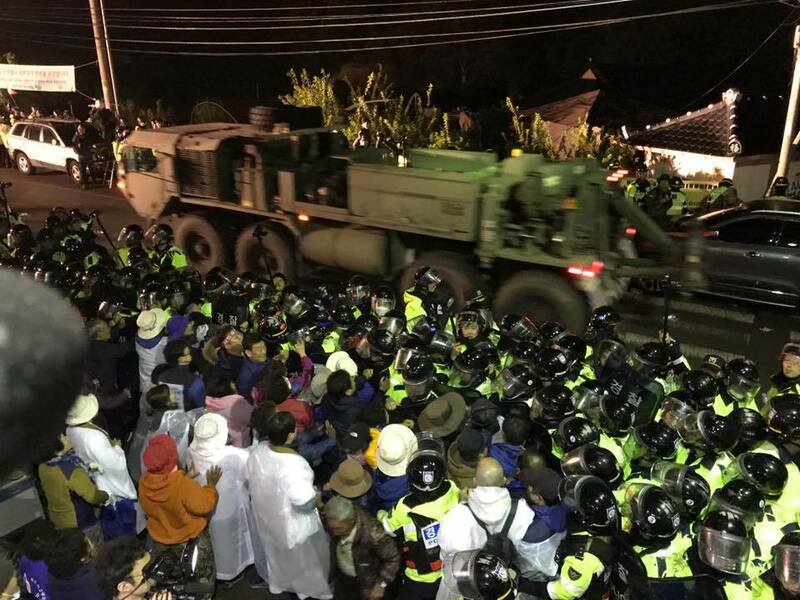 Unless the US interferes in the election, which is quite possible, then the newly elected president would have been likely to slow down this THAAD deployment. Thus Washington was eager to get it done now at all cost. The Seongju community was previously a rock-ribbed conservative area that voted overwhelmingly for the last right-wing government. But the THAAD deployment in their community has changed all of that. They've now not only joined the peace movement in South Korea - but in many respects they are leading the movement today. Not giving up leaders from five different religions in South Korea today began an indefinite hunger strike in solidarity against THAAD. They declared the strike in front of the United States Embassy in Seoul. The US claims that they are 'protecting' the people of South Korea and bringing stability to the Korean peninsula. But that is all lies. 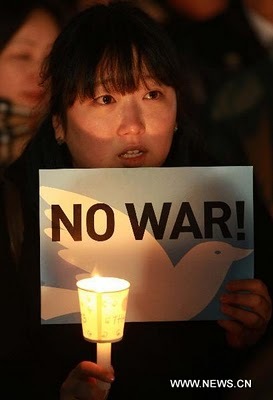 The truth is that the people want the US military to leave Korea and when that happens the world will see a serious reduction of tensions in the region. It is the US military that is driving the Asia-Pacific arms race (something that the military industrial complex knows and loves) and it is the US military 'pivot' of 60% of Pentagon forces into the region that is now the real trigger for WW III. "Is the US really a friend when it deploys THAAD like a thief in the night during a presidential election? 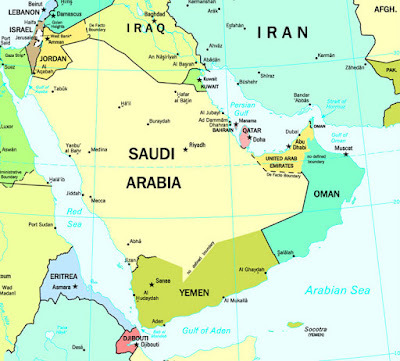 Or is South Korea a US colony?” asked Kim Chung-hwan, the 57-year-old co-chair of the Seongju Committee. The Cassini campaign lasted for three years and it became a rousing international effort. Alan Kohn (one of the speakers in the news conference and former head of NASA's emergency preparedness operation) told us after the successful launch of Cassini that a friend of his working in the White House informed him that they received more communications opposing the Cassini launch than any other issue in the history of the White House. On two trips to South Korea I met a survivor of this US Army slaughter and he took our group to this bridge. 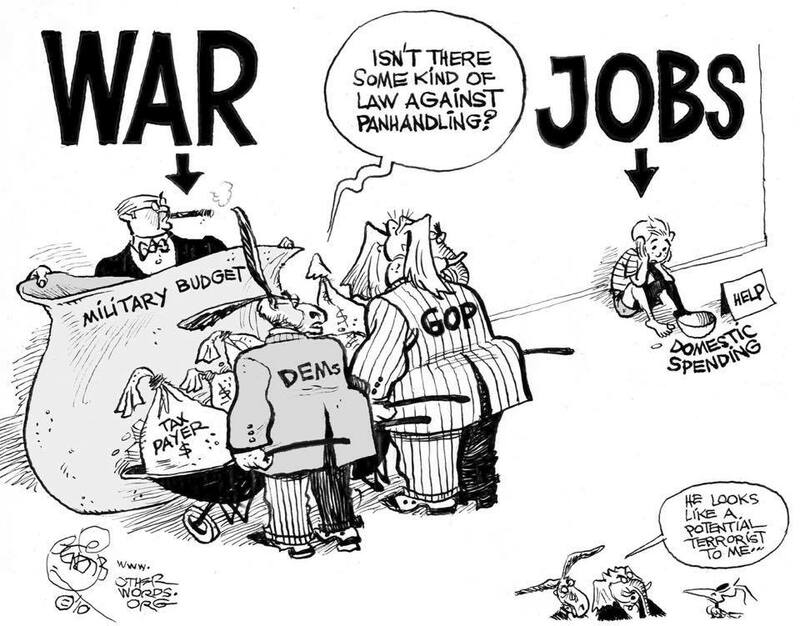 The orders came down from Washington to the US Army commanders during the Korean War to "kill everything that moves." US war planes bombed the long line of civilians running for safety and many ran inside of the bridge tunnel at No Gun Ri. US Army units from the 7th Cavalry used small and heavy arms fire to shoot people inside the tunnels as they crawled out trying to find water. It was a slaughter. Few in America know these stories about the Korean War. Once in the White House, though, Trump announced he would boost the U.S. military budget by a staggering $54 billion, cut back on diplomacy, and push the United States to the brink of active conflict with North Korea. None of this provoked a major backlash. To the contrary, Trump’s surprise bombing of Syria, which, his administration declared, doubled as a warning for North Korea, garnered him across-the-aisle praise from hawks in both parties and his highest approval ratings so far. That “the maw of warmakers [was] insatiable” in Korea, as Robeson remarked in 1950, could be seen in the massive devastation of human life. It was an asymmetrical conflict in which the United States monopolized the skies, raining down ruin. Four million Koreans—the vast majority of them civilians—were killed. Chinese statistics indicate that North Korea lost thirty percent of its population. In North Korea where few families were left unscathed by the terroristic violence of the Korean War, anti-Americanism cannot be dismissed as state ideology alone. "Yes, it would be terrible, but the war would be over there. It wouldn’t be here. It would be bad for the Korean peninsula, it would be bad for China, it would be bad for Japan, it would be bad for South Korea, it would be the end of North Korea but what it would not do is hit America." Graham’s statement is in keeping with the time-honored American tradition of envisioning apocalypse for North Korea—a tradition that survived the Cold War’s end and serves as through-line across successive U.S. presidencies. In recent days, we have been told that the United States must entertain all possible scenarios against North Korea as an interloper in the nuclear club, including a preemptive nuclear strike. "[I]t was the Korean War, not Greece or Turkey or the Marshall Plan or Vietnam, that inaugurated big defense budgets and the national security state, that transformed a limited containment doctrine into a global crusade, that ignited McCarthyism just as it seemed to fizzle, and thereby gave the Cold War its long run." ~ Christine Hong is an associate professor at the University of California, Santa Cruz, and an executive board member of the Korea Policy Institute. She has spent time in North Korea, including as part of a North American peace delegation. 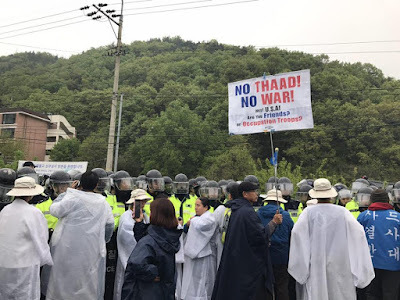 Won Buddhists block military vehicles as they try to enter the US THAAD 'missile defense' deployment site now under construction near Seongju, South Korea. Sitting Bull was a Hunkpapa Lakota holy man from South Dakota and was brought onto the reservation by the US Army in 1881. He toured the east coast of the US as a performer with Buffalo Bill's Wild West show for some time and a story is told that while he was in New York City he sat on a door stoop and all the local homeless street kids came up to him begging for money which he gave them. 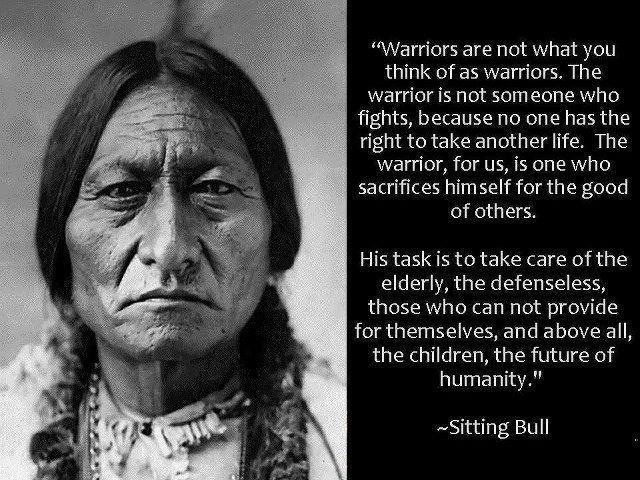 When Sitting Bull returned home to South Dakota he told his people, "We are in big trouble - you should see how the White Man treats his children." The capitalist system is heartless and evil. He also warns of the dangers of the US following the insane advice of the neo-cons who appear to have pushed their way back into power within the Trump administration.